Well, he said he'd be back. Exciting news for Terminator franchise fans: despite how terrible Terminator: Genisys was, it seems that Arnold Schwarzenegger will be returning for the sixth film in the franchise. That follows the even more exciting news that James Cameron is also returning, after regaining the rights to his own franchise. What this franchise needs is a level head to write a good story that doesn't rely on the kind of silliness that underpinned Genisys (complete with its ridiculous ignorance of science), and Cameron is an important part of that. It's still great to see Schwarzenegger there as well, as it gives the film its nostalgic boost too. It's unlikely we'll see Cameron direct Arnie again as the reformed killing machine (since he has 500 Avatar movies to make), but a calming influence at production level is a welcome thing. 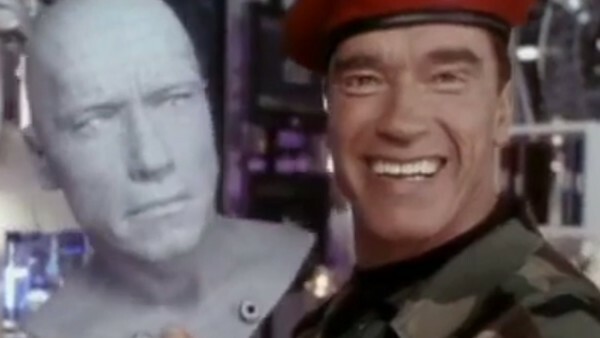 And hopefully they might entertain the idea of pitting good-guy Terminator Arnie against bad guy Terminator Arnie in a more substantial way than the brief scene in Genisys. That'd be a start at least.